Though I feel sassy and comfortable in heels, I always have a pair of flats around (in my bag, car, office). I also keep extra clothes too. They come in handy! Gray maxi skirt; Option 1 (pleated maxi via Target) | Option 2 (plaid) | Option 3 (gorgeous Rick Owens on sale). Omg. This look is great. Thank you so much for the links you provide with your outfits. I have found such great sites along the way. I have champagne test on a beer budget…lol, so you know i am always on the hunt for great deals and sites for designer items. Thanks again. Stay blessed. Oh wow! Thank you all so much. Val Skin that’s absolutely correct…you are a long time reader 🙂 Abigail Musemburi so happy to hear that. I will keep doing my best 🙂 Much love! Since finding your blog, you have single-handedly revigorated my love for fashion. I’m in the midst of re-purposing what I have in my closet to make old new again! Love, Love, Love your style! <3 your necklace is great! @stylepantry Yey I love @MoshoodCreation ! Nice look! @lacentraf @MoshoodCreation Ahhh! I always stop by Moshood every New York chance I get 🙂 Thank you much! 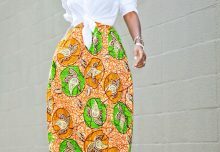 I was looking @ Moshood’s site but I didn’t see this skirt. Do u know if its still available? I can’t get enough of this look right here!